Stage-lift system with threaded rods. TILTING at windmills like Don Quixote can be a harmless fantasy, but what happens if a windmill decides to have its own tilt? That was the issue facing engineers in Holland who needed not only to delicately lift a 700-tonne windmill built in 1699, but also to correct its slightly askew centre of gravity when repositioning it to allow for heightening of a dyke. The solution: three banks totalling 28 double-acting Enerpac cylinders of a type widely used for heavy lifting on Australian and New Zealand construction, mining, municipal and conservation sites. For the lift required by the municipality of Vlissingen, the cylinders were operated through a custom-engineered control system that took account not only of the considerable weight being hoisted, but also of the fact that greater lift was required on one side and that the building was extremely old. The delicate operation began last year as part of the process of heightening the Oranje dyke in Vlissingen, one of the final phases of a larger Delta project. This dyke remains still a weak link in the struggle against extremely high water and had to be heightened by two metres in order to protect the Zeeland countryside behind it from flooding. The dyke owners, the municipality of Vlissingen, had two options: take the mill apart and reconstruct it from scratch after heightening the dyke, or lift the mill in situ to the required height. Practical considerations and the desire to keep the mill intact (it was still operating on a daily basis) resulted in adopting the latter option. The mill was given first a new concrete foundation about 75 cm thick, a foundation that would also support it during lifting. While this foundation was being cast, a total 112 threaded three-metre rods, arranged in four groups, were injected around and within the mill. The entire weight of the foundation and the mill upon it was suspended from these threaded rods. Recesses were included in the foundation (between four threaded rods) for steel support pipes for the hydraulic lifting cylinders. The support pipes rested on the fixed base under the mill. The lifting system was completed by the 28 double acting RR-Series 50-ton hydraulic cylinders from Enerpac, arranged into three separate groups and giving a total lifting power of 1400 tonnes. Distribution of the lifting jacks over the foundation had to take into account the precise centre of gravity of the mill, with more power being required on the side of the vanes. A steel sleeve with transverse profile supported the bottoms of the cylinders. Two reinforced I-profile beams were clamped to this sleeve and retained on the threaded rods with nuts. A steel plate with a similar I-profile was placed on top of the cylinder, resting on the piston and secured with nuts to the four surrounding threaded rods. Once assembled, the operation of the lifting system was relatively straightforward. 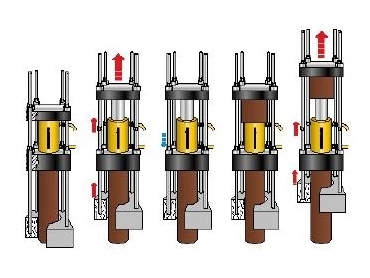 Pressure was applied to each cylinder by a heavy-duty Enerpac pump through three separate oil supplies. When pressure was applied to the cylinders, their plunger rods emerged, pressing upwards the steel plate above them and carrying with it the threaded rods bearing load. After the cylinder reached its maximum stroke, the bottom four nuts were screwed downward and the two bottom I-profiles clamped back onto the sleeve, securing the threaded rods in that position. The plunger rod was then withdrawn, after which the nuts were screwed downwards in order to clamp the upper plate again to the plunger rod. The lifting cycle then resumed. Progress was checked at three points along the mill using three simple measuring rods. In this way, the mill was lifted step-by-step for two metres, then secured to the steel support tubes with a rigid connector. Following completion of the dyke heightening and soil compaction, the mill is expected to be back in perfect operation this year.